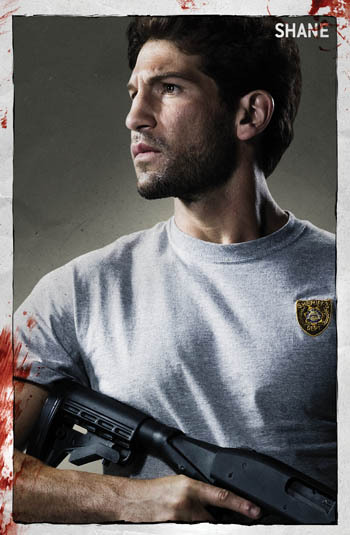 Like the show or not the one thing that The Walking Dead tv series has always had have been some good marketing people. From the marketing leading up to the premiere season and now leading up to it’s upcoming fourth season the show continues to honor it’s comic book legacy. For the upcoming San Diego Comic-Con spectacle AMC TV and the people behind The Walking Dead tv series have unveiled the SDCC-exclusive poster for the upcoming season. Season 1 saw noted comic book cover artist and illustrator Drew Struzan come up with the exclusive poster. For Season 2 we had another famous comic book illustrator in Tim Bradstreet with the honor. Last year’s Season 3 at SDCC saw Greg Capullo come up with the poster. For the Season 4 poster that will be given out at this year’s San Diego Comic-Con one of the best cover and comic book illustrators in the business will do the honors. I speak of Alex Ross who has cemented his place in comic book fandom with his work on such comic books as Marvels and Kingdom Come. While Alex Ross has been known more for his superhero illustrations the fact that he’s doing a horror-themed illustration just shows that the show still continues to remain strong and people continue to want to be involved with it in one fashion or another (or AMC just paid Alex Ross a nice chunk of change). 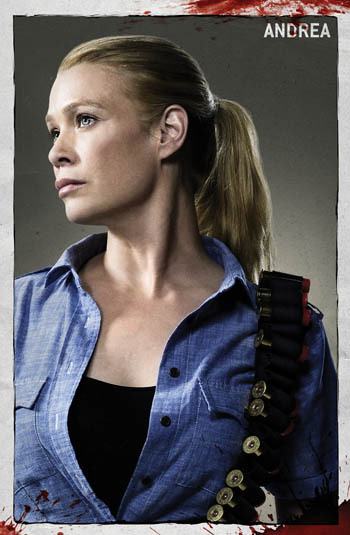 Below are the past SDCC-Exclusive posters for The Walking Dead. Originally from Oregon City, Oregon, Drew Struzan studied at the Art Center College of Design. Struzan started out his career as an illustrator by designing album covers. He illustrated his first movie poster in 1975 and, since then, he has been responsible for over 150 posters. He has designed posters for everything from the Star Wars to Harry Potter. With Comic-Con over the hype surrounding the tv adaptation of Robert Kirkman’s zombie apocalypse comic book series has reached stratosphere status. The 6-episode first season was already one of the most anticipated new shows of the upcoming fall season from just the fans and geek community talking about it nonstop in the internet, but with it’s unveiling at this year’s San Diego Comic-Con the mainstream press has latched itself onto the series. The common reaction to the series at the panel in Hall H seemed to be a unanimous positive one. Character photos, Drew Struzan posters and new trailers have added to the hype. The comic book series has hit it’s milestone 75th issue. Sales of the comic and it’s collected softcover and hardback graphic novels have seen a spike in sales. AMC has added to the series’ website a taste of the the comics for people to get an idea of what to expect from the series. This motion comic of the first issue of The Walking Dead really captures the horror and hopelessness of the world Kirkman has created and Daabont plans to show up on the TV screen. That name alone will bring big smiles and goofy grins to film geeks and comic book fanboys the world over. Struzan has been one of the go-to artists when a studio wants a beautifully painted poster for their film. He’s done poster artwork for some of the most iconic films of the last 50 years. He’s done all the poster work for the Indiana Jones and Star Wars franchise. Of late he’s done some great work on film posters for the Harry Potter and Hellboy franchises. In 2007 he created some wonderful poster art for a scene early in Frank Darabont’s film adaptation of the Stephen King novella, The Mist. Struzan also created a poster for that film. 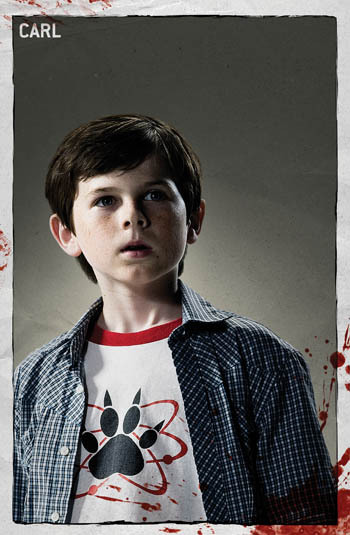 He and Darabont have been close friends so it wasn’t much of a surprise that Struzan would end up creating a film-style poster for Darabont’s tv adaptation of the fan-favorite and critical darling comic book series, Robert Kirkman’s The Walking Dead. 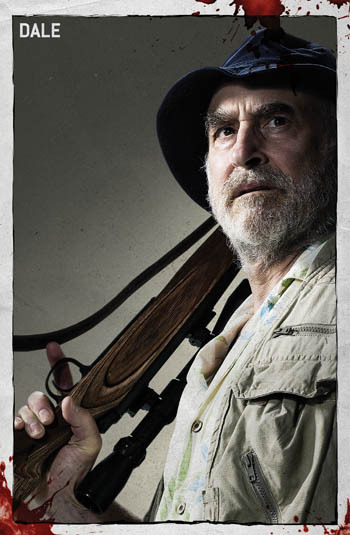 The poster below is being premiered and given out by AMC at SDCC (San Diego Comic-Con) 2010 as part of their promotion for the series to premiere this October on AMC. To see the image below in its HQ glory then head on over to AICN which got the exclusive to show it before SDCC. 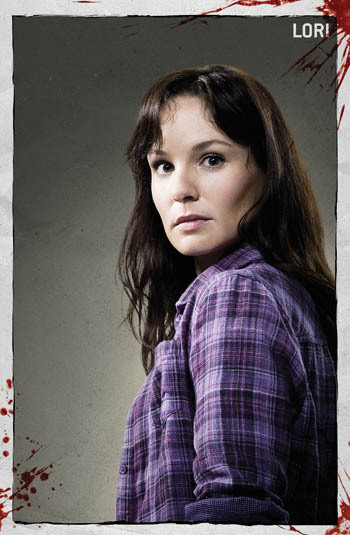 In addition to the Struzan poster AMC has also released individual photos of each cast member as their characters in the show plus two pictures of zombies who will populate the series. The actors really do a good job of becoming like their characters in these photos. 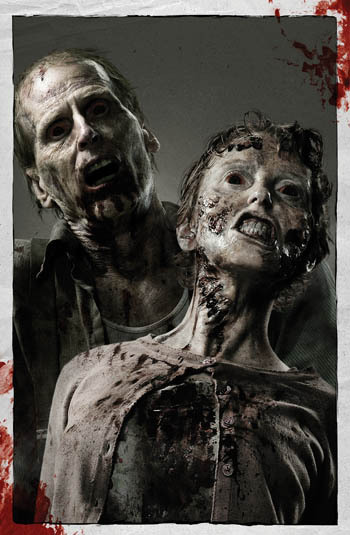 The zombie pictures really show just why Greg Nicotero and his KNB Effects are the preeminent people when it comes to creating zombie make-up effects. 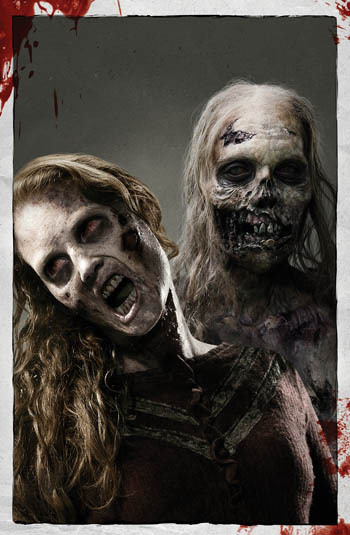 These zombies look great and definitely reinforces the point that AMC will not waterdown the comic book for tv. 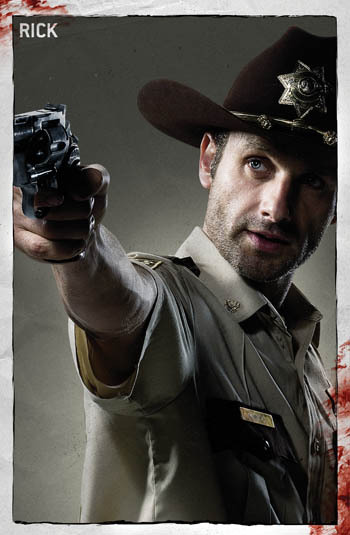 Andrew Lincoln as Rick Grimes for some reason really resembles Viggo Mortensen in his character photo.